So I installed CGRU.2.2.3 on windows 10 and I was able to render on my farm with 3ds max 2018.3 and V-Ray 3.6. I'm really excited to see it's working!!! but in the task window I have some problems. the task progress always stay at 0% and when I right click a task I don't see all the option that are supposed to be there like preview etc I see only open task, skip task and reset task. This means that task/block does not have "files" parameter. It was not set by submission script. To debug tasks that hung, better to launch task command just in the system console. Sometimes windows applications, even command line applications, rise some windows, and waits for the user to close it. And afrender can close such windows automatically. You will always notice more and more bugs using it. Linux, that was once correctly setup, will work like swiss watches all the time 24*7. Wow!!! I want definetely to switch to linux! I want to switch to houdini and linux but for now I still need to use 3ds max in my project and there is no max for linux yet and probably will never be. "python" "C:\cgru.2.2.3\afanasy\python\afjob.py" "\\ISEIJIN\Projets 3D\JOT\JOT_GIGANTO\3dsmax\scenes\testAfanasy\scene.max" 1 100 -by 1 -fpt 10 -seq 1 -os any -pwd "\\ISEIJIN\Projets 3D\JOT\JOT_GIGANTO\3dsmax\scenes\testAfanasy" -name "scene.max"
There is no -file parameter. I add something like -file "path/to/my/render.exe" it should then show the % progresing and thumbnails? Last edited by Strob on Mon Nov 20, 2017 1:42 pm, edited 2 times in total. And by the way the tasks are not hanging they just progress without showing me the % in the tasks window. A quick way to test task command is to run task command directly. Not within Afanasy. Double-click task to receive its data. Copy command and paste in a console (cmd.exe). 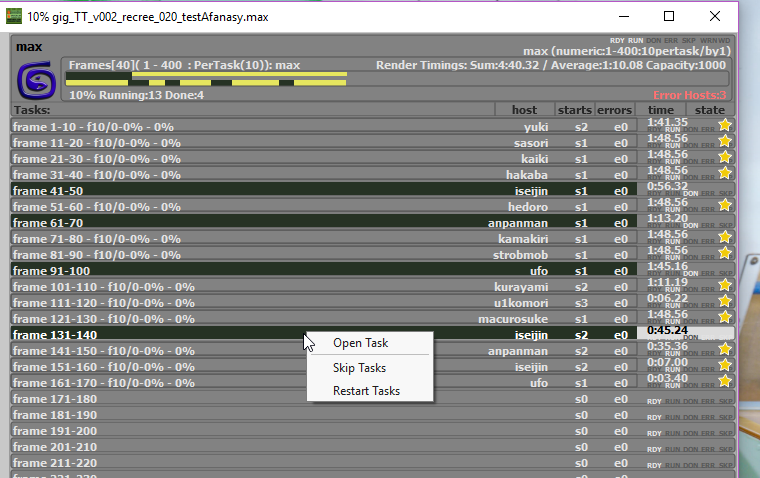 Also CGRU has a script for 3dsmax to run tasks directly from an application. In application we can query images files and specify it in a job block. Ok thanks I will try that!